The most magical season of the year is knocking on us, so it’s time to start the with the decoration with the glittering lights and boughs of evergreen. 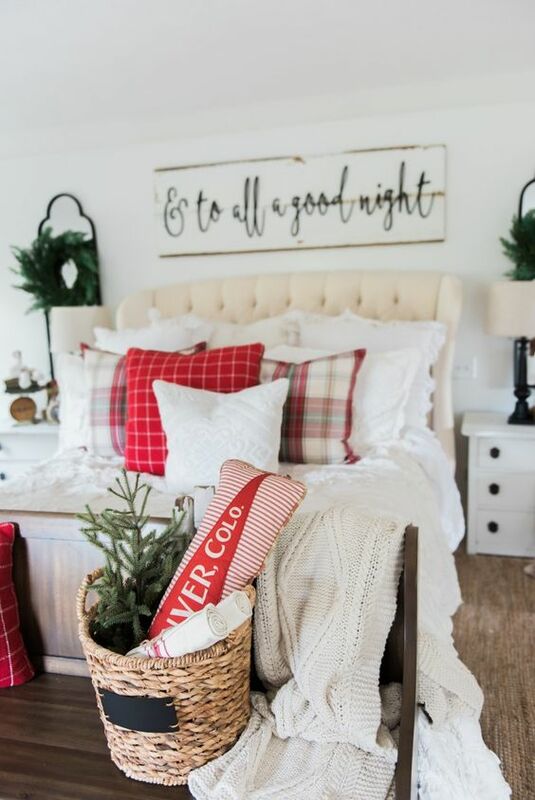 When you’re decorating for Christmas, you need to take care of not just living and dining room, but also where you relax after a long day at work, the bedroom. 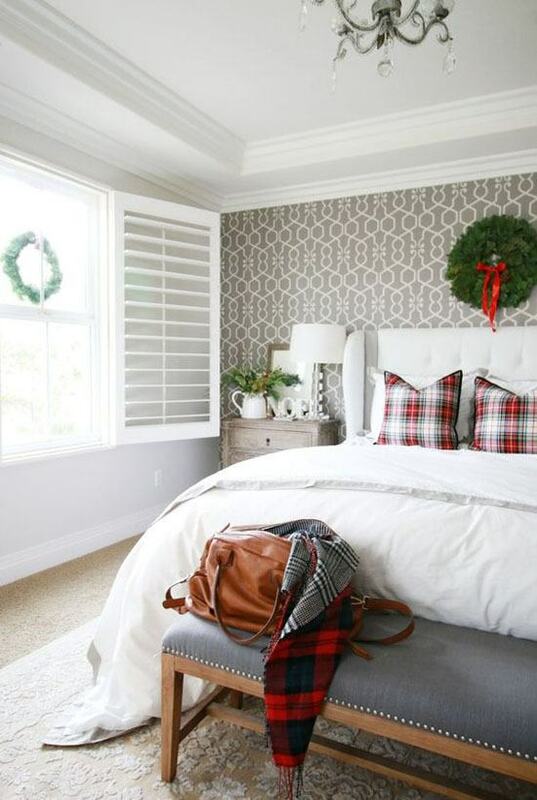 There are several ways to decorate the bedroom for Christmas. You can make it festive and merry by decorating it with traditional red and green elements. Or you can opt for silver or white to give it a more sophisticated look. 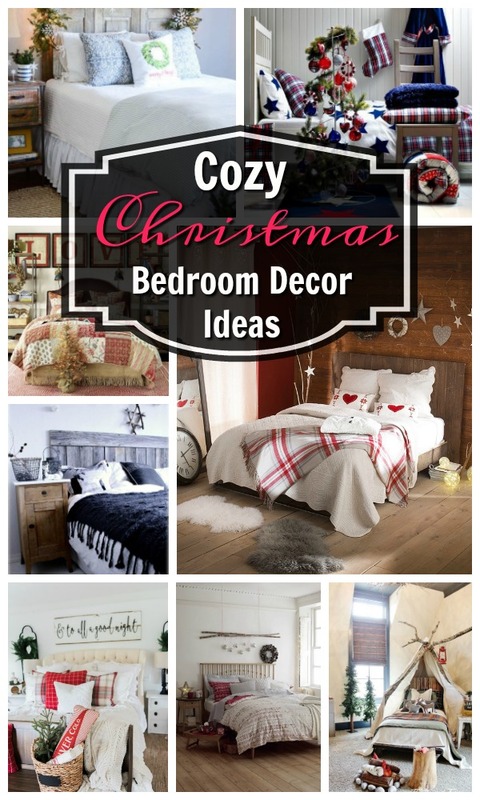 Have a look at our compilation of Christmas bedroom decorating ideas below! 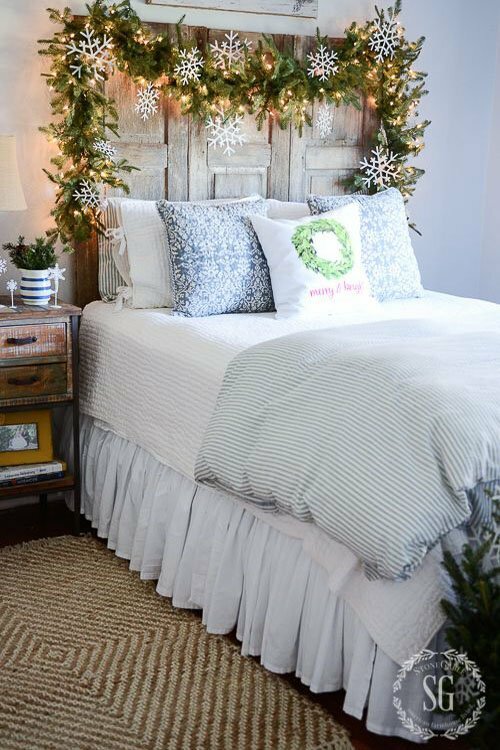 An evergreen garland, fairy lights, and faux snowflakes are all you need to make a dreamy bedroom for the Christmas. The bedroom here looks very cool and casual with blankets lying here and there. The wreath is adding a perfect touch. 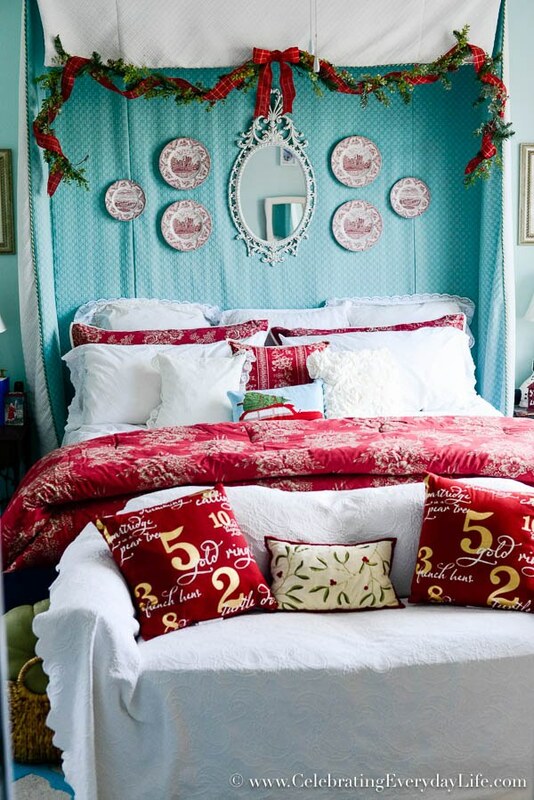 This cozy and cheerful room is an excellent inspiration for Christmas décor. 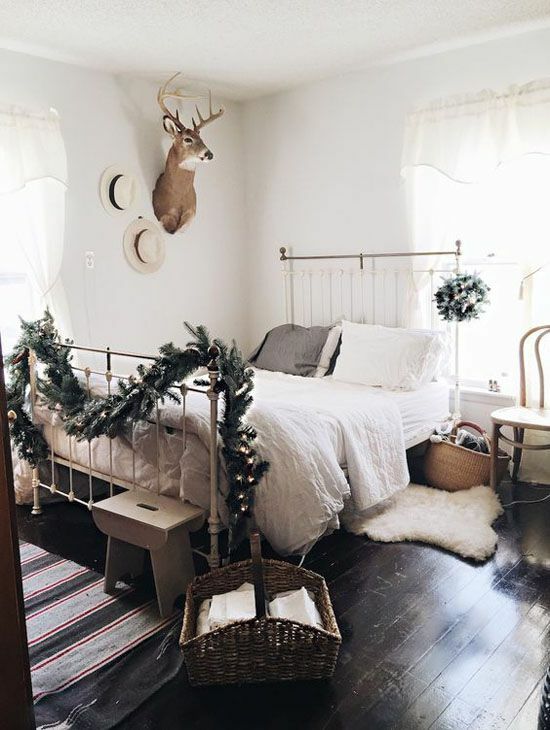 The basket hung from the bed is looking incredibly cute. A lot of effort has been to give this bedroom a vintage touch. 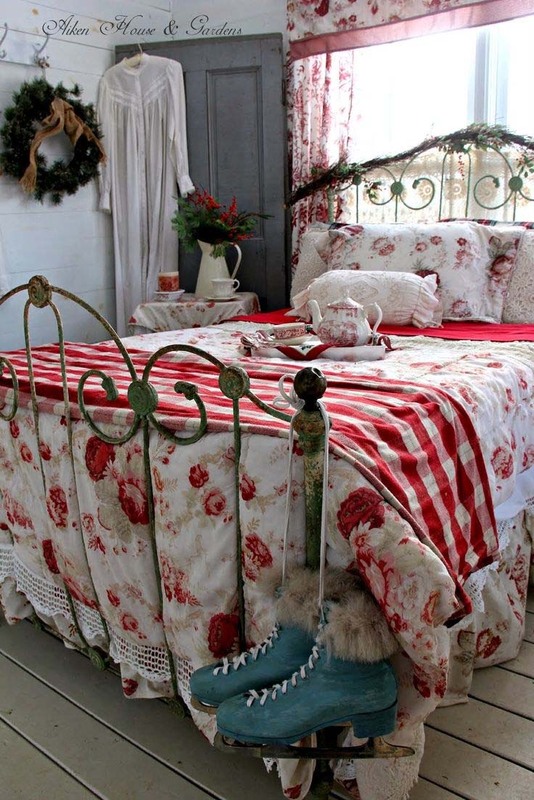 The wrought iron bed, the bed sheet, the wreath, everything harkens back to the olden times. This absolutely adorable design is perfect for children’s room. The colors chosen are festive and are arousing happy feelings just by seeing it. 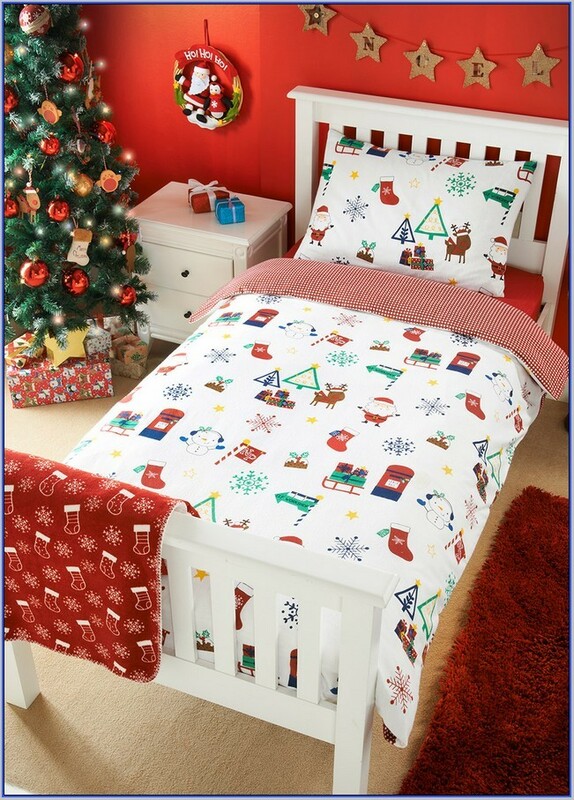 Leave everything and get this quilt with all the Christmas symbols printed on it. It will refresh and recharge you on the Christmas morning like no other thing. Here’s a lovely, neat and clean, modern décor for you to follow. 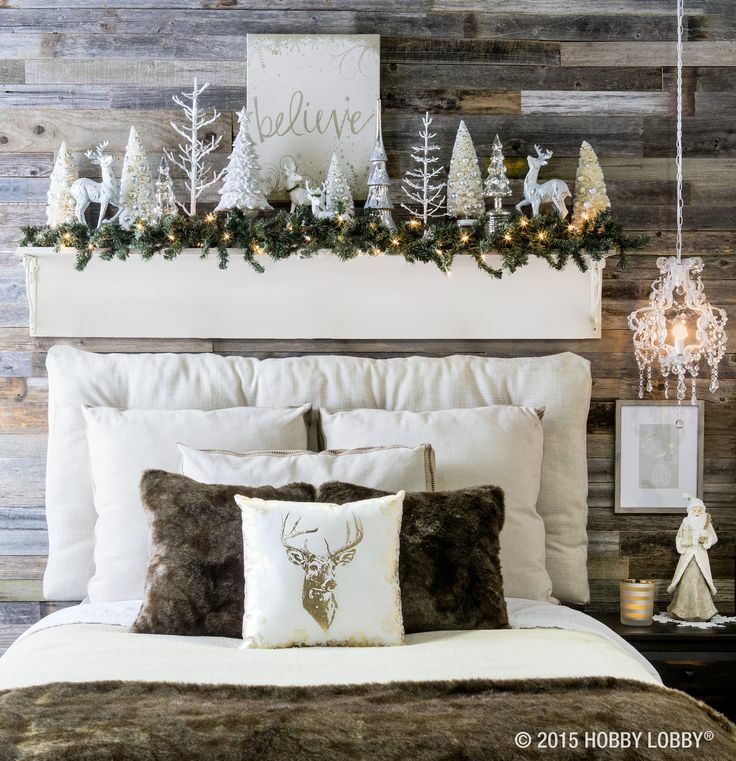 What we loved the most is the ornament branches used on the bedside table. 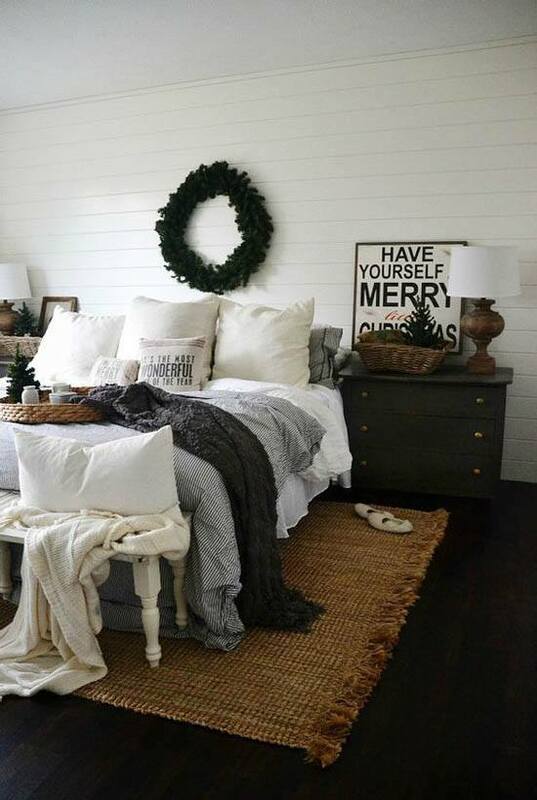 Create a winter wonderland like look in your house by decoration the room with the above idea. You just need to get hold of a few stuffed logs, animals, and wooden blocks. If not anything, just use a small sized Christmas tree to get your room in the Christmas spirit. Use traditional ornaments for decorating the tree. 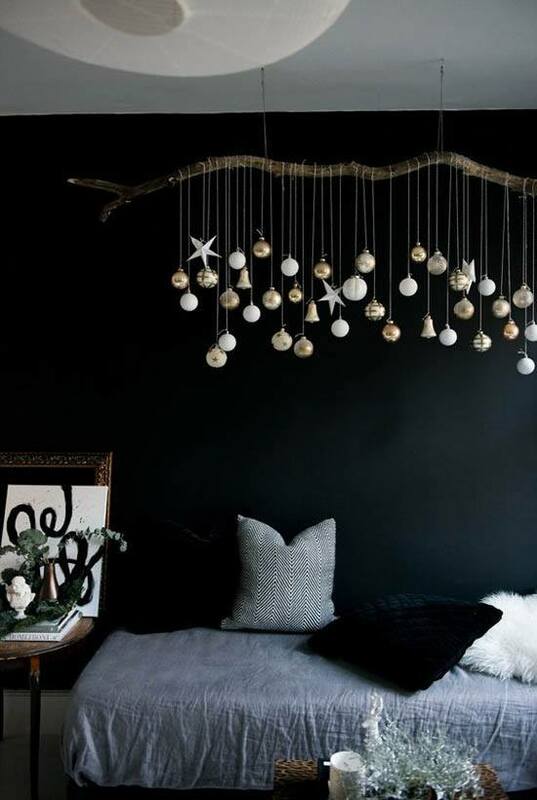 If you have a modern décor and want to keep things simple, you can hang a star from the ceiling to make it Christmas friendly. We didn’t know gray could look so beautiful. 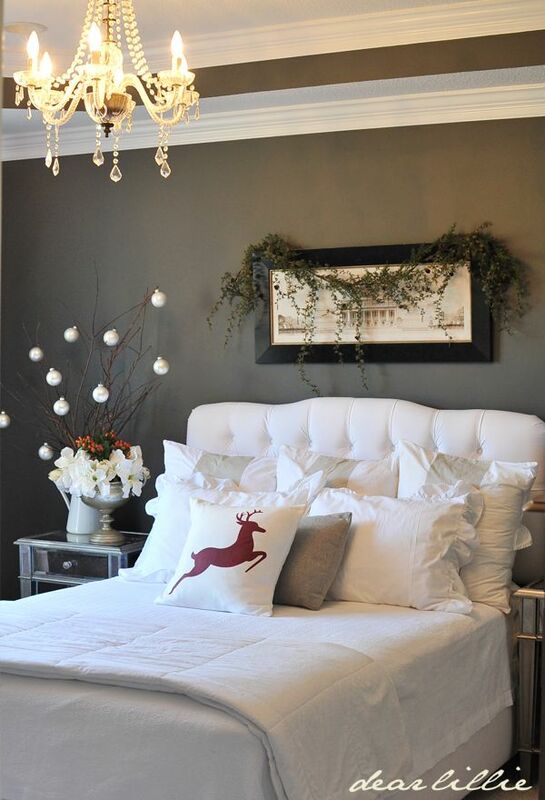 The felt reindeer head is an excellent option for people who want to keep things understated. 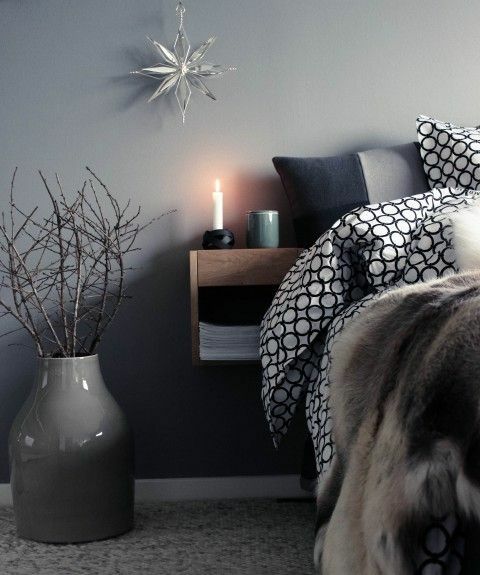 If you wish to follow Scandinavian décor, you can opt the above idea for the bedroom. It’s minimalist, but is still making a strong statement. The top shelf of the room is transformed to make it look like a mantelpiece. Let the children decide what they would want to put on the shelf. Even they’ll feel important. 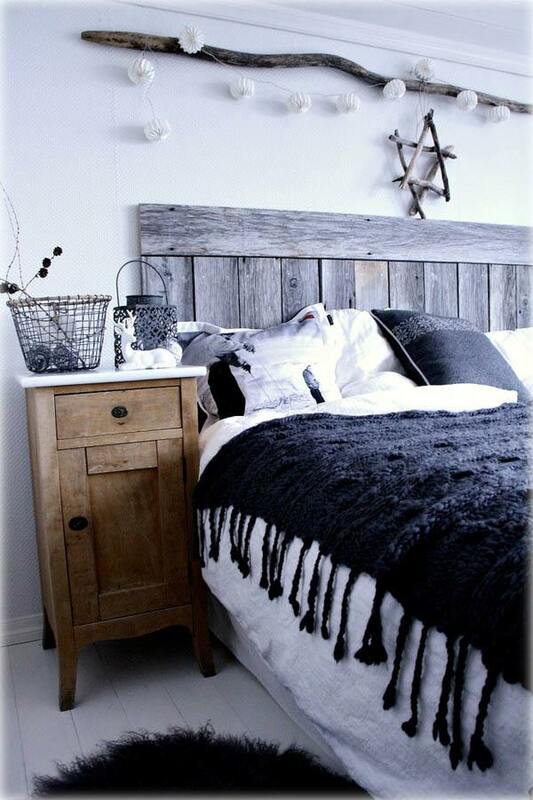 The bedroom in the picture is done in both rustic, yet modern look. And even the color combination is stunning. Here’s a quick way to spruce up your teen’s room. 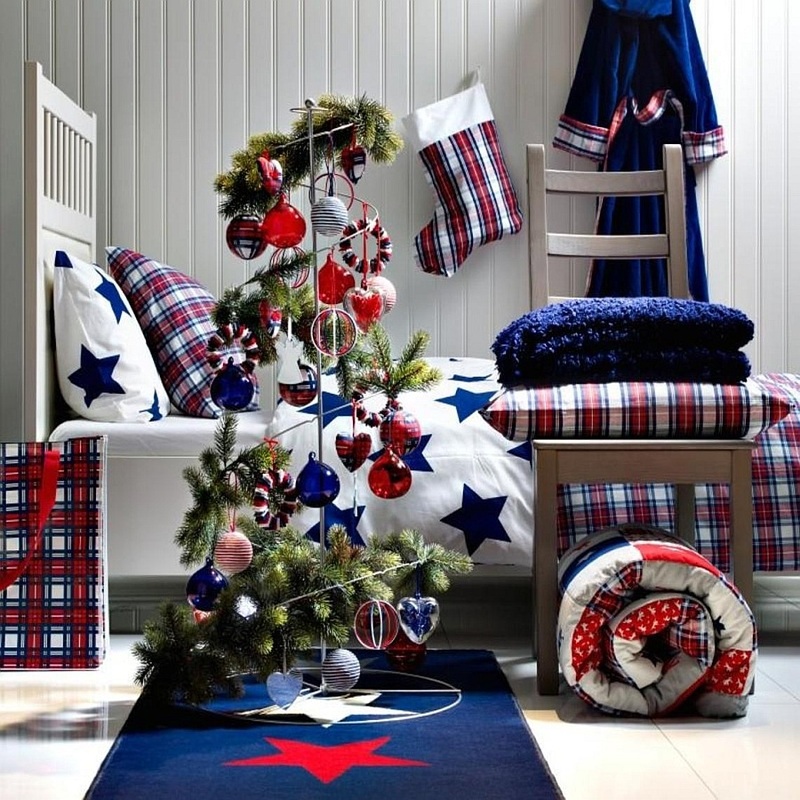 Place a modern Christmas tree in the room decorated with ornaments that go with the color of the room. 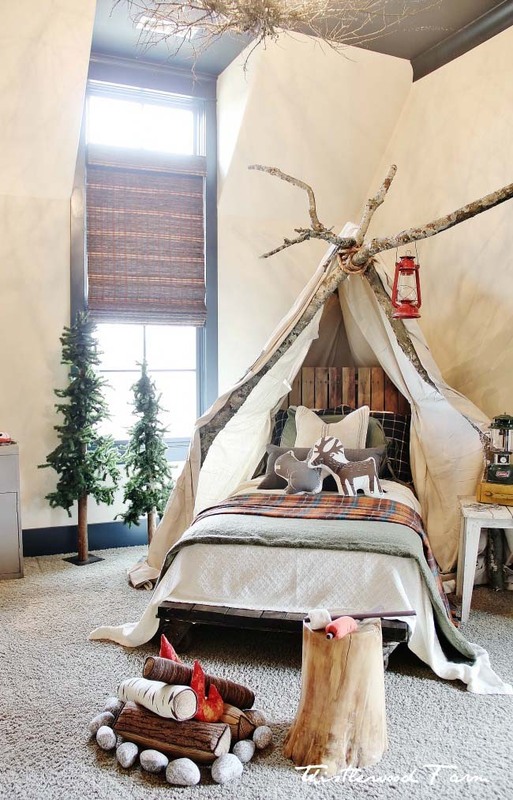 Make your child’s room festive and whimsical by decorating it with a wreath, star ornaments. Everything will spell out Christmas. 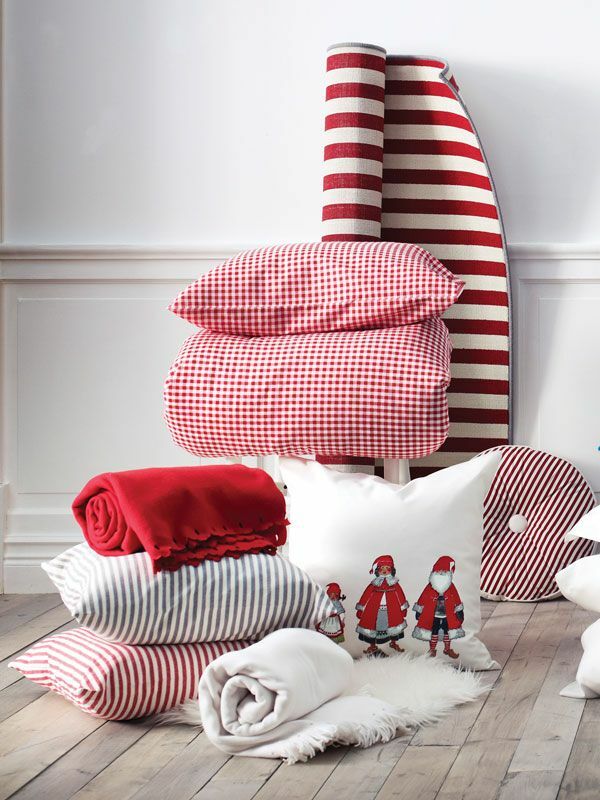 These beddings and upholsteries look so adorable. These will look great stacked in the corner also. Such a bright and vibrant way to decorate your child’s room. 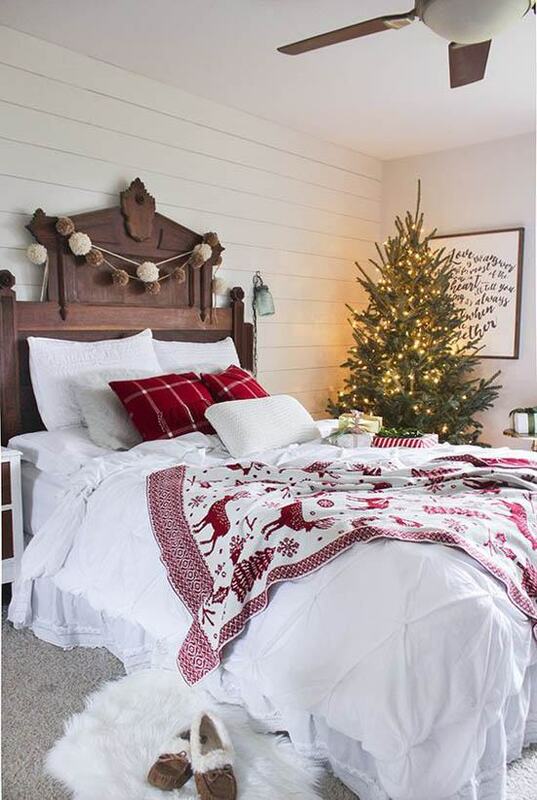 The Christmas tree is a must use in this décor. It will cheer the children as well. This pristine white look is understated, yet effective. 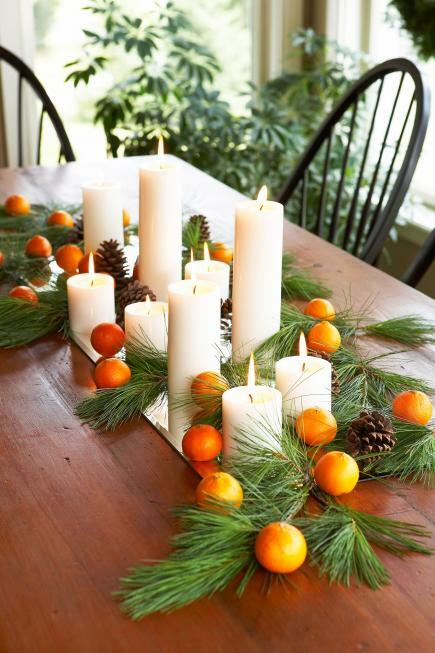 Just a few elements have been added for decoration like tabletop trees, and evergreen wreath. 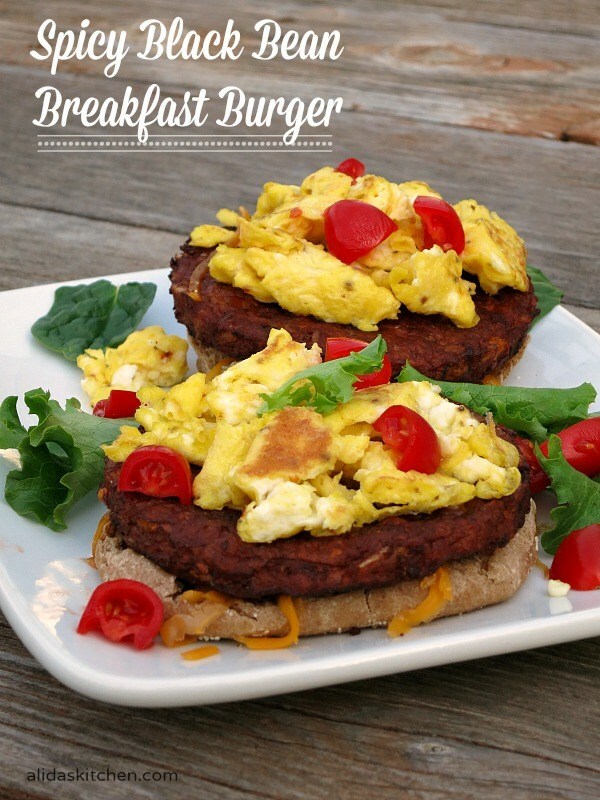 Woodsy, rustic and natural is what is in the right now. The bedroom here has followed a rustic approach to the decoration. Even the walls are given a wooden touch to enhance the warm and inviting vibe of the room. Red is the go-to color of Christmas. So why not accept it wholeheartedly? And despite being so reddish, the room isn’t looking over the top. We loved the colors used for decorating this room. 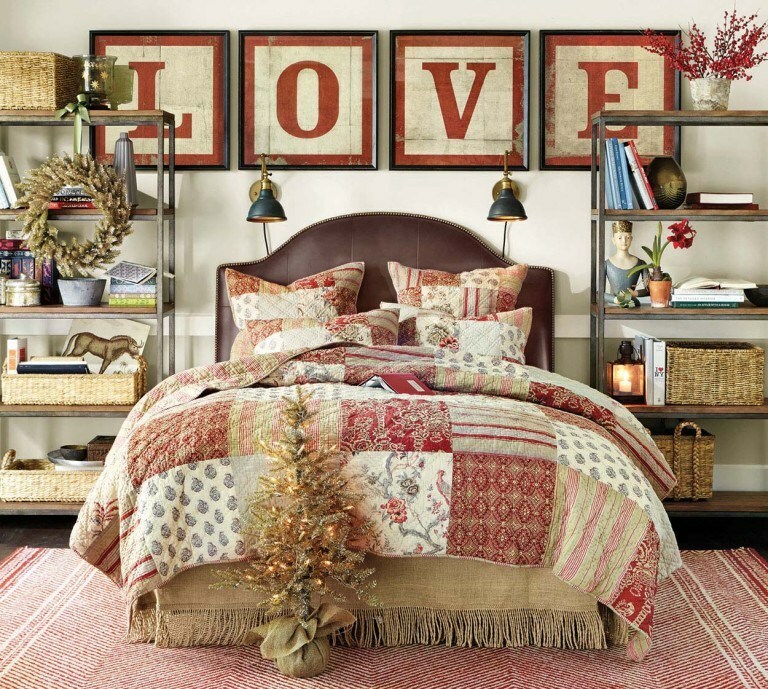 Put the gifts on a stool or chair placed near the bed. This pistachio green and magenta color combination is looking absolutely out of the world. The feather wreath is a perfect modern element. 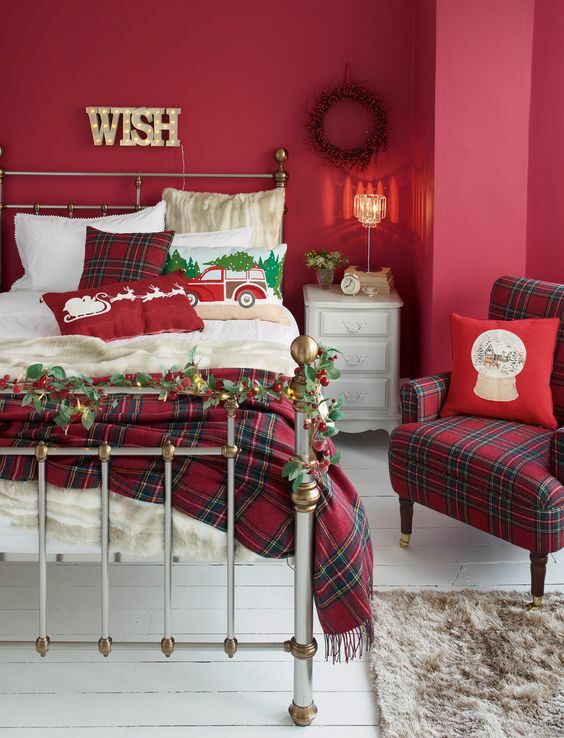 This bedroom is Christmassy in the truest sense. The red and blue color combination is looking stunning. And the floral pattern will suit even beyond the holidays. Christmas decoration doesn’t always have to be colorful. You can infuse the festive spirit in the onlookers without going over the top. Here, just a garland is used to give it a Christmas touch. A Christmas ornament branch, something like you see in this picture, is all you need to transform your house for the Christmas. You’re free to change the color of the ornaments anyway you like. 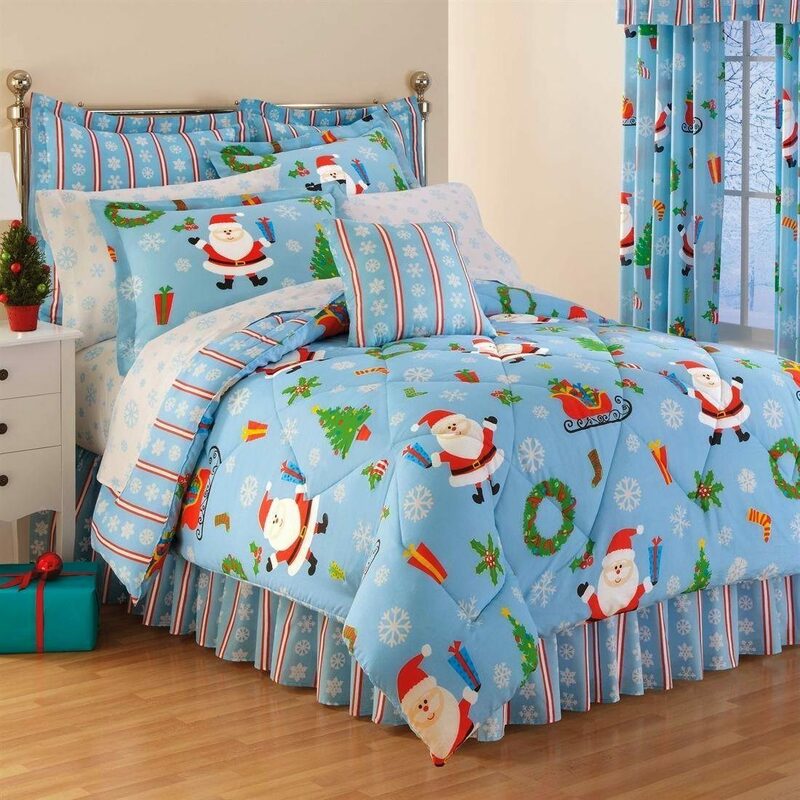 This Christmas special bedsheet is utterly adorable. Children will be delighted to see their bed with this spread. A typical Christmas bedroom. 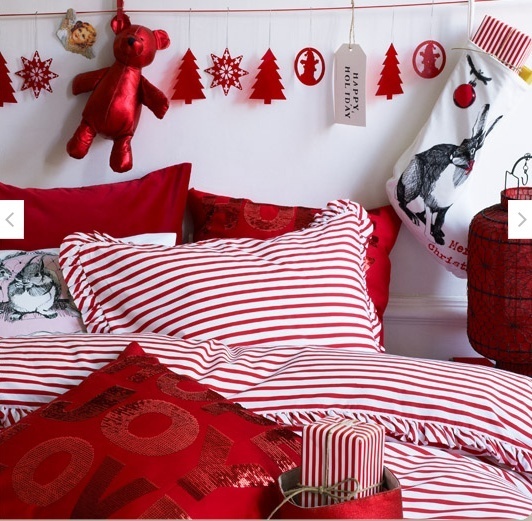 The reindeer figurine, wooden Christmas trees and red and white bedsheet are taking the décor to an entirely new level. 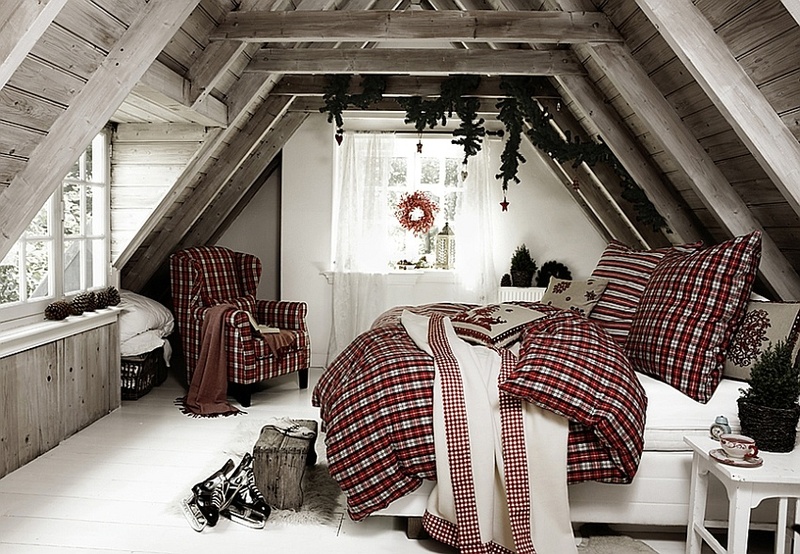 The natural greens, checked upholstery, and tiny Christmas tree are giving this attic an intimate look. In this image, just a wreath is used to up the ante. 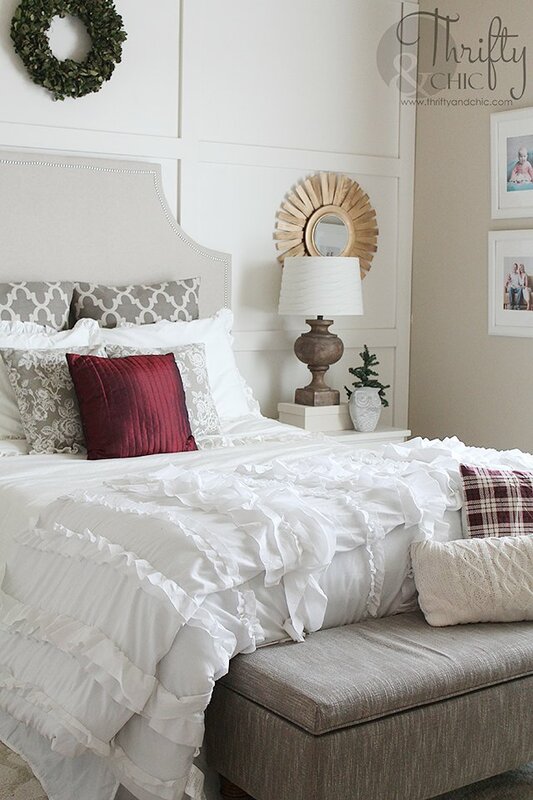 The plaid cushion covers are also adding a perfect element.